Cynanchum medium , auct. non R. Br. Vincetoxicum medium , auct. non (R. Br.) Dcne. Cynanchum rossicum is a perennial vine native to Eastern Europe that has established invasive populations in Canada and the USA. Once established, dense monocultures of the plants displace native vegetation, alter habitats, and reduce biodiversity. In particular, C. rossicum threatens rare and vulnerable alvar ecosystems in the Lower Great Lakes Basin. The species also invades and negatively impacts Christmas tree farms, horticulture nurseries and orchards, and perennial agriculture such as no-till corn and soybean fields. Successful management of the species has proven difficult, as the use of chemical controls or mechanical removal methods must be repeated annually for several years. However, a potential biological control agent, Hypena opulenta, is currently being evaluated. Cynanchum rossicum is a perennial, herbaceous vine. Plants have horizontal, woody rootstalks that form short rhizomes, with abundant pale, fleshy, lateral fibrous roots. Stems are more or less erect, but as plants mature they twine around grasses, each other, or trees for support. Stems are also pubescent in longitudinal bands, and typically reach 60-200 cm, though especially in shaded forest understories plants can grow two to three times this length. Leaves are generally 7–12 cm long and 5–7 cm wide, ovate to elliptical, acute at the tip, and have smooth margins with occasional pubescence. They are arranged oppositely, with the largest leaves occurring in the middle of the stem. Flowers are five-petaled, star-shaped, about 5–7 mm in diameter, and are borne in clusters. The corolla is light pink, reddish brown, or maroon. The fleshy corona is distinctly 5-lobed with the lobes united only at the base, and is slightly darker than the corolla. Fruits are slender, tapered follicles, about 4-7 cm long, and usually form two per flower. The seeds are light to dark brown, obovoid to oblong, may measure 4–6.5 × 2.4–3.1 mm, and have a membranous marginal wing with an apical tuft of hairs (DiTommaso et al., 2005; PCA, 2006). The species twining habit and opposite, glabrous, shiny leaves distinguish C. rossicum from other native and introduced species in the north-eastern US and adjacent regions of Canada (Lawlor, 2009). C. rossicum’s invasion of North America appears to include a very long lag phase (about 100 years) after initial naturalization, followed by an exponentially rapid phase of spread. Researchers believe that the species displays an Allee effect - a reproductive feedback in small plant populations in which population density and reproductive and survival rates are strongly positively correlated (Kricsfalusy & Miller, 2009; Cappuccino, 2004). Flowering of Cynanchum rossicum can begin as early as mid to late May for populations in central New York and will peak several weeks later in early to mid June. Fruit development typically begins in early June in central New York, with maturity occurring 4–5 weeks after flowering, and finally dehiscence peaking at the end of July (Douglass et al., 2009). Mature C. rossicum ramets typically attain a height of 0.5 /2.0 m before dying back to root crowns in the fall (Cappuccino, 2004). Cynanchum rossicum is an ornamental vine, and was intentionally introduced into North America, most likely for its horticultural and botanical value. Indeed, for much of the twentieth century plants were available for purchase in the nursery industry (Averill et al., 2008b; Douglass et al., 2009). Cynanchum rossicum occurs in temperate climates in North America and Eurasia. It has been reported on the edges of alluvial woods, railroad embankments, fencerows, and maple, beech, oak and ash forests in Ontario and western Quebec, and gardens, grassy slopes, and streambanks in southern Ontario. Other recorded habitats include grasslands, such as verges, lawns, old fields, etc., pastures, hedgerows, and gardens. In New York State, it occurs in a variety of habitats , including: calcareous shoreline outcroppings, cliffs, talus slopes, barrens and woodlands; successional old fields, shrublands and forest openings; riverside sand and gravel bars; mesic maple-basswood forests; pasturelands and crop fields; conifer plantations; limestone quarries and dredge spoils; as well as disturbed sites. C. rossicum establishes in full sun or under forest canopies, and while plants may form monospecific stands in all light conditions, growth and fecundity are normally higher in open fields or forest gaps. Plants will tolerate a wide variety of substrates, including silty and sandy loams, glacial till, deep loams, or rocky/gravelly soils, but prefer shallow, calcareous soils. In its introduced range, the distribution of C. rossicum normally includes temperature ranges in the winter of -11 to 0.7°C and in the summer of 20.7–26.4°C, with mean annual precipitation levels of 776–1,206 mm. A mean soil pH of 6.7 at a shaded site and 7.0 at an open site has been observed for C. rossicum (DiTommaso et al., 2005). Research has indicated that generally emergence and establishment of C. rossicum is higher at the upper extent of this range of pH levels (Magidow et al, 2007). There appears to be a physiological dormancy requirement for C. rossicum seeds, as under experimental conditions, high degrees of germination (greater than 90%) are only found in seeds that are subjected to a stratification treatment of three months (Douglass et al, 2009). Tufted seeds are released from follicles and disperse in late summer and fall (Cappuccino, 2004). Observations indicate that a large proportion of seeds remains close to the parent plant, though small, satellite populations are often found downwind of large seed source populations (Lawlor, 2009). A typical C. rossicum stand can produce as many as 54,000 seedlings per m² annually (Smith et al., 2006). Root crown fragments support dormant buds that readily sprout if not destroyed (PCA, 2006). Cynanchum rossicum was intentionally introduced to New York state and Canada from Ukraine as an ornamental specimen (Averill et al., 2008b). Principal source: DiTommaso, Antonio; Frances M. Lawlor; Stephen J. Darbyshire, 2005. The biology of invasive alien plants in Canada. 2. Cynanchum rossicum (Kleopow) Borhidi [= Vincetoxicum rossicum (Kleopow) Barbar.] and Cynanchum louiseae (L.) Kartesz & Gandhi [= Vincetoxicum nigrum (L.) Moench]. Canadian Journal of Plant Science. 85(1). JAN 05. 243-263. Averill, K.M., Ditommaso, A., Mohler, C.L., Milbrath, L.R. 2008. The Invasive Swallow-worts: What Do We Know About Their Biology and Management?. International Allelopathy Congress. p. 71-71.
Review: Cameron H. Douglass, Department of Bioagricultural Sciences & Pest Management, Colorado State University. Recommended citation: Global Invasive Species Database (2019) Species profile: Cynanchum rossicum. Downloaded from http://www.iucngisd.org/gisd/species.php?sc=1563 on 21-04-2019. C. rossicum has negative effects in agricultural and horticultural ecosystems as well. Christmas tree growers in central New York state have reported increased problems stemming from invasions of the species in plantations, especially within the last decade. Orchard owners east of Rochester, NY cited C. rossicum as their most problematic weed species, since it rapidly and severely alters abiotic and biotic features of tree understories by: decreasing sunlight penetration; increasing nutrient and water acquisition (swallow-wort species have abnormally high root to shoot biomass ratios); and altering rhizosphere dynamics both through shifts in the mycorrhizal communities and the exudation of allelopathic chemicals. Horticultural nursery owners and Christmas tree producers affected by pale swallow-wort infestations have reported that due to a lack of effective control methods, land abandonment was often the most reasonable option (Douglass et al., 2009). Furthermore, C. rossicum has become problematic in no-till corn and soybean fields in several central and western New York State counties. Finally it serves as a host for various insect pests of crops and as an alternate host of Cronartium rusts that attack Pinus species (DiTommaso et al., 2005). Informations on Cynanchum rossicum has been recorded for the following locations. Click on the name for additional informations. Bon, M., Sforza, R., Jones, W.A., Hurard, C., Milbrath, L.R., Darbyshire, S. 2008. Pinpointing the origin of North American invasive Vincetoxicum spp. using phylogeographical markers. In: Julien, M.H., Sforza, R., Bon, M.C., Evans, H.C., Hatcher, P.E., Hinz, H.L., and Rector, B.G., editors. International Symposium on Biological Control of Weeds, April 23-27, 2007, La Grande Motte, France. CAB International Wallingford, UK. p. 448. Ditommaso, A., Bittner, T., Milbrath, L.R. 2010. Management of pale swallow-wort (Vincetoxicum rossicum) using mowing and herbicides in two contrasting habitats. Proceedings of Northeastern Weed Science Society. p. 32. Mattila, Heather R.; Otis, Gard W. 2003. A comparison of the host preference of monarch butterflies (Danaus plexippus) for milkweed (Asclepias syriaca) over dog-strangler vine (Vincetoxicum rossicum). Entomologia Experimentalis et Applicata. 107(3). June 2003. 193-199. McKague, Curtis I; Cappuccino, Naomi, 2005. Response of pale swallow-wort, Vincetoxicum rossicum, following aboveground tissue loss: Implications for the timing of mechanical control. Canadian Field-Naturalist. 119(4). OCT-DEC 2005. 525-531. Milbrath, L.R., Averill, K.M., Ditommaso, A. 2008. Vegetative expansion and seed output of swallow-worts (Vincetoxicum spp.). In: Julien, M.H., Sforza, R., Bon, M.C., Evans, H.C., Hatcher, P.E., Hinz, H.L., Rector, B.G. (Editors). International Symposium on Biological Control of Weeds, April 23-27, 2007, La Grande Motte, France. CAB International Wallingford, UK. p. 251. Smith, L.L., A. DiTommaso; J. Lehmann; S. Greipsson, 2008. Effects of arbuscular mycorrhizal fungi on the exotic invasive vine pale swallow-wort (Vincetoxicum rossicum). Invasive Plant Science and Management 1 (2), pp. 142-152. Tewksbury, L.; R. Casagrande, and A. Gassmann, 2002. 16: Swallow-worts. In: Van Driesche, R., et al., 2002, Biological Control of Invasive Plants in the Eastern United States, USDA Forest Service Publication FHTET-2002-04, 413 p.
Bjureke, Kristina. 2007. Vincetoxicum rossicum on the islands of the Inner Oslo fjord: transferred from a red-listed species to a pest species. Blyttia. 65(2). 2007. 76-85. Blanchard, Megan L.; Jacob N. Barney; Kristine M. Averill; Charles L. Mohler and Antonio DiTommaso, 2010. Does polyembryony confer a competitive advantage to the invasive perennial vine Vincetoxicum rossicum (Apocynaceae)? American Journal of Botany. 2010;97:251-260. Cappuccino, Naomi. 2004. 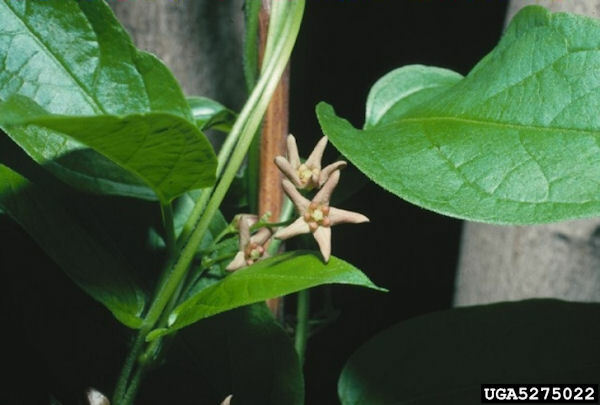 Allee effect in an invasive alien plant, pale swallow-wort Vincetoxicum rossicum (Asclepiadaceae). Oikos. 106(1). July 2004. 3-8. Cappuccino, Naomi; Robin MacKay; Candice Eisner, 2002. Spread of the invasive alien vine Vincetoxicum rossicum: Tradeoffs between seed dispersability and seed quality. American Midland Naturalist. 148(2). October 2002. 263-270. Casagrande, R. A; Dacey, J. E. 2007. Monarch butterfly oviposition on swallow-worts (Vincetoxicum spp.) Environmental Entomology. 36(3). JUN 2007. 631-636. DiTommaso, Antonio; Daniel C. Brainard; Bradley R. Webster, 2005b. 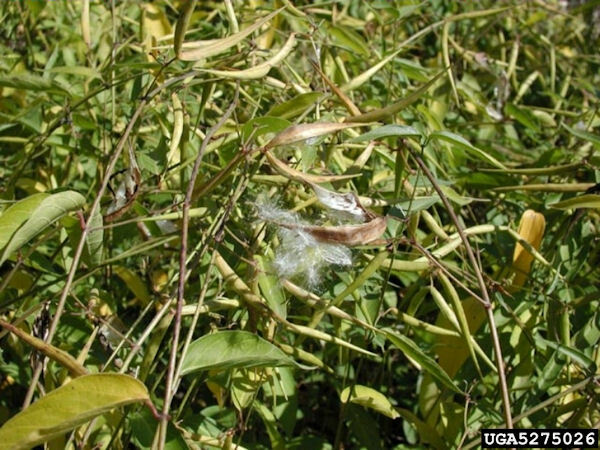 Seed characteristics of the invasive alien vine Vincetoxicum rossicum are affected by site, harvest date, and storage duration. Canadian Journal of Botany. 83(1). January 2005. 102-110. DiTommaso, Antonio; Frances M. Lawlor; Stephen J. Darbyshire, 2005. The biology of invasive alien plants in Canada. 2. Cynanchum rossicum (Kleopow) Borhidi [= Vincetoxicum rossicum (Kleopow) Barbar.] and Cynanchum louiseae (L.) Kartesz & Gandhi [= Vincetoxicum nigrum (L.) Moench]. Canadian Journal of Plant Science. 85(1). JAN 05. 243-263. DiTommaso, Antonio; Losey, John E. 2003. Oviposition preference and larval performance of monarch butterflies (Danaus plexippus) on two invasive swallow-wort species. Entomologia Experimentalis et Applicata. 108(3). September 2003. 205-209. Ernst, Crystal M.; Naomi Cappuccino, 2005. The effect of an invasive alien vine, Vincetoxicum rossicum (Asclepiadaceae), on arthropod populations in Ontario old fields. Biological Invasions. 7(3). MAY 05. 417-425. Hotchkiss, Emily E., Antonio DiTommaso; Daniel C. Brainard; Charles L. Mohler, 2008. Survival and performance of the invasive vine Vincetoxicum rossicum(Apocynaceae) from seeds of different embryo number under two light environments. American Journal of Botany. 95(4). APR 2008. 447-453. Kricsfalusy V. & Miller G. 2008. 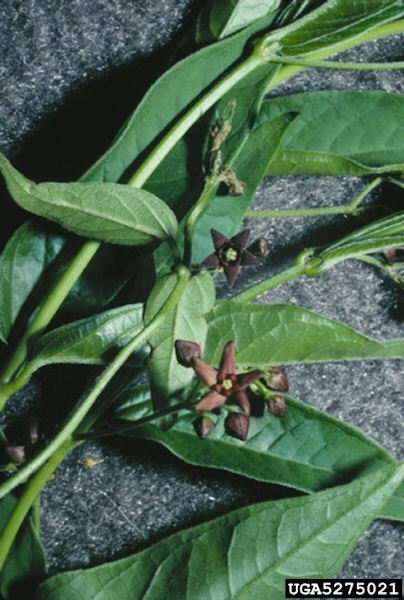 Invasion and distribution of Cynanchum rossicum (Asclepiadaceae) in the Toronto region, Canada, with remarks on its taxonomy. � Thaiszia � J. Bot. 18: 21- 36. � ISSN 1210-0420. Ladd, David; Naomi Cappuccino, 2005. A field study of seed dispersal and seedling performance in the invasive exotic vine Vincetoxicum rossicum. Canadian Journal of Botany. 83(9). SEP 2005. 1181-1188. Milbrath, R. Lindsey, 2008. Growth and reproduction of invasive Vincetoxicum rossicum and V. nigrum under artificial defoliation and different light environments. Botany 86 (11), pp. 1279-1290. Mogg, Christopher; Philippe Petit; Naomi Cappuccino; Tony Durst; Curtis McKague; Miranda Foster; Jayne E. Yack; John T. Arnason; Myron L. Smith, 2008. Tests of the antibiotic properties of the invasive vine Vincetoxicum rossicum against bacteria, fungi and insects. Biochemical Systematics and Ecology Volume 36, Issues 5-6, May-June 2008, Pages 383-391. Sheeley, Scott E.; Dudley J. Raynal, 1996. The distribution and status of species of Vincetoxicum in eastern North America. Bulletin of the Torrey Botanical Club. 123(2). 1996. 148-156. Smith, Larissa L.; Antonio DiTommaso; Johannes Lehmann; Sigurdur Greipsson, 2006. Growth and reproductive potential of the invasive exotic vine Vincetoxicum rossicum in northern New York State. Canadian Journal of Botany. 84(12). DEC 2006. 1771-1780. St. Denis, Melissa; Naomi Cappuccino, 2004. Reproductive biology of Vincetoxicum rossicum (Kleo.) Barb. (Asclepiadaceae), an invasive alien in Ontario. Journal of the Torrey Botanical Society. 131(1). January 2004. 8-15. Taylor, Caz M.; Hastings, Alan, 2005. Allee effects in biological invasions. Ecology Letters. 8(8). AUG 2005. 895-908. USDA, ARS, 2010. Taxon: Cynanchum rossicum Kleopow Synonym of Vincetoxicum rossicum (Kleopow) Barbar. National Genetic Resources Program. Germplasm Resources Information Network - (GRIN) [Online Database]. National Germplasm Resources Laboratory, Beltsville, Maryland. USDA, NRCS. 2010. Cynanchum rossicum (Kleopow) Borhidi. European swallow-wort. The PLANTS Database (http://plants.usda.gov, 2 March 2010). National Plant Data Center, Baton Rouge, LA 70874-4490 USA. Weston, Leslie A.; Jacob N. Barney; Antonio DiTommaso, 2005. 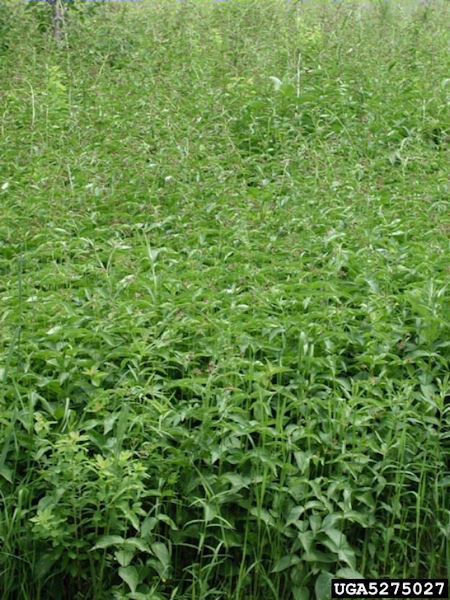 A review of the biology and ecology of three invasive perennials in New York State: Japanese knotweed (Polygonum cuspidatum), mugwort (Artemisia vulgaris) and pale swallow-wort (Vincetoxicum rossicum). Plant & Soil. 277(1-2). DEC 2005. 53-69.